So what do you give a World Champion to say congratulations? 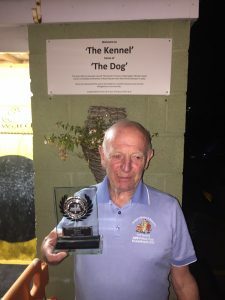 Well the committee at Abingdon UTD Aunt Sally HQ were quick to decide that our own Barrington ‘Mutley’ Parker needed some formal recognition for his achievements and Abingdon United presented him the Special Club Events award. Recognition from his friends and fellow tossers was always going to have to be a bit different ,but the combined brains, mainly from the Sporting Icons that are the AUFC ‘C’ team, came up with a solution. With permission granted from AUFC the Aunt Sally shed has been named ‘The Kennel’, home of the dog. A fitting tribute that will be seen by all visiting players, just as it should be. Ab. Utd. ‘A’ survived a 1st leg scare to beat Ab. Utd. ‘C’ 5-1 with leg scores of 15-15, 13-11, 17-12. For Utd ‘A’ D.Dix 14, D.Davies & B.Duff (making his 1st appearance) 10 each & B.Parker hit 7. For the inspired Utd. ‘C’ Dave ‘Fox’ Warrell making his 1st appearance included a 6 in his 11, M.James 10 & C.Keeley 8. Jon Warrell needing 4 to take the 1st leg just failed by missing with his last stick. Utd. ‘C’s 38 dolls was their highest total. Spread Eagle ‘A’ inflicted a 2nd 6-0 defeat on the trot for an under par Penlon. The leg scores were 14-8, 14-10, 13-5. For Spread ‘A’ B.Newman & J.Bowler 10 each, S.Humphries 9 & J.Gapper 8. In reply for Penlon D.Bellcourt 8 & T.Lach 7. Penlons’ 23 dolls was their lowest total so far. 4 man Ab. Legion caused the upset of the night by beating Spread Eagle ‘B’ 4-2 with leg scores of 11-10, 12-8, 10-14. For The Legion S.Champ 10, P.Ealey 9, N.Hazell & D.Sapey 7 each. For Spread ‘B’ N.Weston & L.clapton 8 each, R.Nicholls & S.Enock 6 each. The Heathens beat Ab. Utd. ‘B’ 4-2 with leg scores of 11-7, 8-9, 17-13. For The Heathens A.Woolloff 12 (his 1st double figures of the season), P.Longford managed a blob in his 8, D.Holmes & T.Downes each hit 6 dolls with Terry also blobbing. For Utd ‘B’ S.Martin 9, K.Souch 7 & P.Arnold 6. Norma Green throwing more like Norma Jean managed 2 in the 3rd leg to avoid the dreaded X-X-X. Ab. Con. Club managed their highest total of the season to ensure their 1st 6-0 win of the seasaon. It came against The Brown Owls with leg scores of 10-9, 11-10, 13-5. For The Con. Club B.Clapton hit 11 (somehow), P.Barrett 10 & D.Todd 8. R.North throwing like a one armed fisherman managed just 1 doll, coming in the 3rd leg.